This month's agenda was about the size of the yellow pages. Regardless the meeting was focused and the debate interesting. There were well over 3,00 people at this morning's dawn start to Anzac Day. The ceremony was a little longer than usual and run by the RSL. It was good to see so many children at the event. The bell tolling from St Augustines was great as were the Glen Osmond Primary School choir. 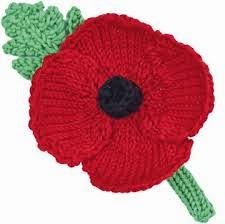 I was impressed by the knitted/crocheted poppies I have seen in many places this year. 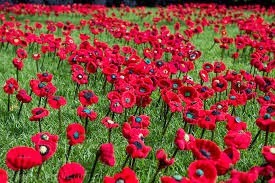 Goolwa looked a treat last weekend with it's war memorials decked out in the poppies. It's good to know that the Premier, Jay Weatherill, does not support council amalgamations. According to this morning's Advertiser he said yesterday that councils should be smaller rather than larger and encourage a role for volunteers within the organisation. Good news indeed, just hope that his Ministers have been briefed on this and agree with him. This hasn't been the case for development assessment to the system's detriment. I never have understood why one group saying something loudly and often seems to have more power than lots of people say the same thing? Outgoing LGA President Mayor David O'Loughlin has a nightmare vision of thousands of pulped Council rates notices. 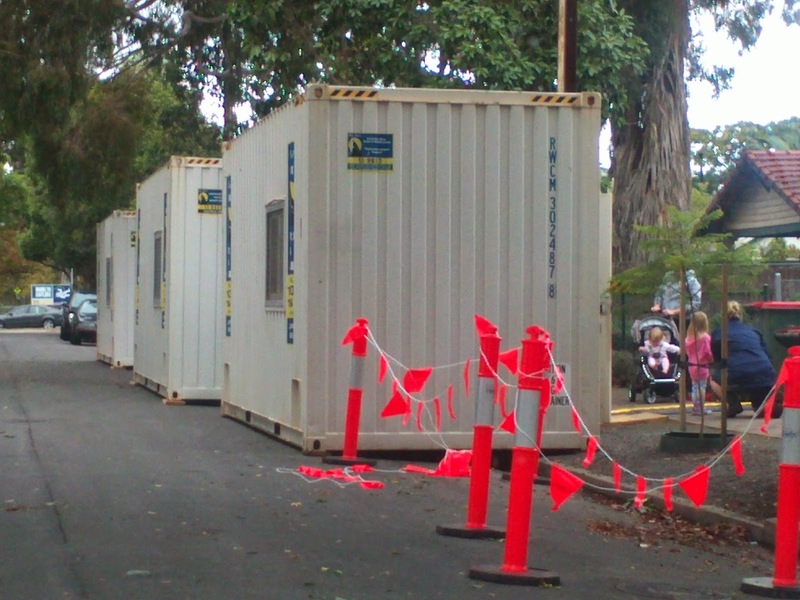 Currently the Rates and Land Tax Remissions Act and regulations require the State Government to fund the concessions but Treasurer Tom Koutsantonis has said they will not do so after 1 July - yet the laws remain unchanged." "Under current legislation Councils by law are required to print State Governmentconcessions on rates notices," Mayor O'Loughlin said. "The Treasurer needs to tell Councils now if he is going to put up legislation to axe concessions before the rates notices are printed." "If legislation is introduced after rates notices are printed Councils will have no option but to pulp them.
" It's a scenario which could see at least 160,000 notices pulped and reprinted across the state, adding to ratepayers' costs and community confusion. ," he said. The proposed curb extensions (in East Ave) to enhance pedestrian safety will be installed before the end of June, there were only two objections to the proposal. DPTI are yet to confirm their intentions for South Rd and the proposed changes to Byron Rd are still in abeyance. Hopefully, they will soon admit they have no money now or in the foreseeable future for this work and Byron Rd changes can be implemented. Don and I will put a Motion to Notice to Council regarding both the necessity to improve the safety of pedestrians and cyclists using the Greenway shared use path and to try to get some assurance from DPTI that they will upgrade and fence the dog track that links Millswood Cres and Arundel Ave to Millswood Station. The final trees that need to be planted in Canterbury Tce should be done in Before June (western end). 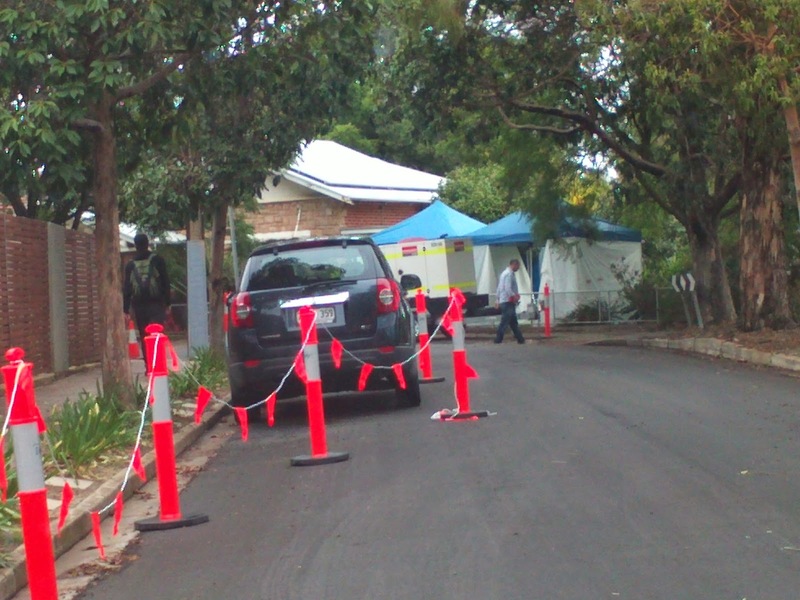 Footpaths likely to be included in the 2015/16 budget are Cowper Rd, Kelvin Ave andHacket Ave. The other 9 that remain to be done will be completed in the final 2 years of the accelerated programme. Linemarking and greening the bike lanes should follow the completion of the now resurfaced East Ave within two weeks. This will also include the missing green paint on the crossing just north of the rail line. Missing linemarking at the corner of Lonsdale and Arundel should also be completed. In Ormonde Ave over half the residents responded to the treescape proposal. 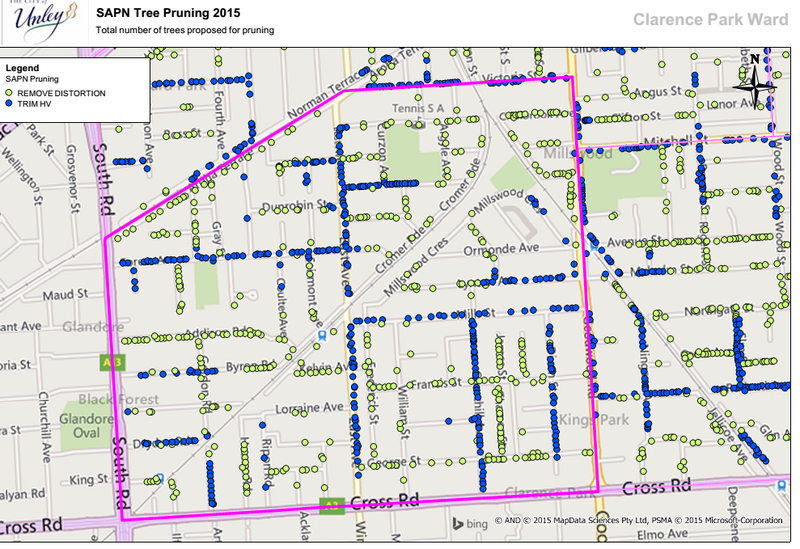 Council will now remove the 14 dead and dying tress (to be marked with a white dot). These will be replaced with the existing species. Planting will also be undertaken in the pocket of land off the walkway between Victoria St and Cranbrook Ave. Species chosen will be similar to those that are doing well in Devon St. 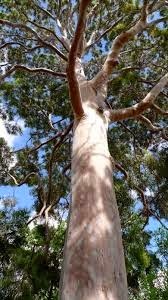 However, it will also include two trees that have the potential to become significant (angophora). The City of Unley is committed to increasing the use of alternative forms of transport, particularly bicycles. Accordingly, Council has endorsed the formation of a Bicycle User Group (BUG) for the City of Unley, with a vision of increasing the percentage of bike users throughout the City. We are inviting the community to be involved by becoming a BUG member. Possible locations for bike racks. Organising social ride events for members and the community. 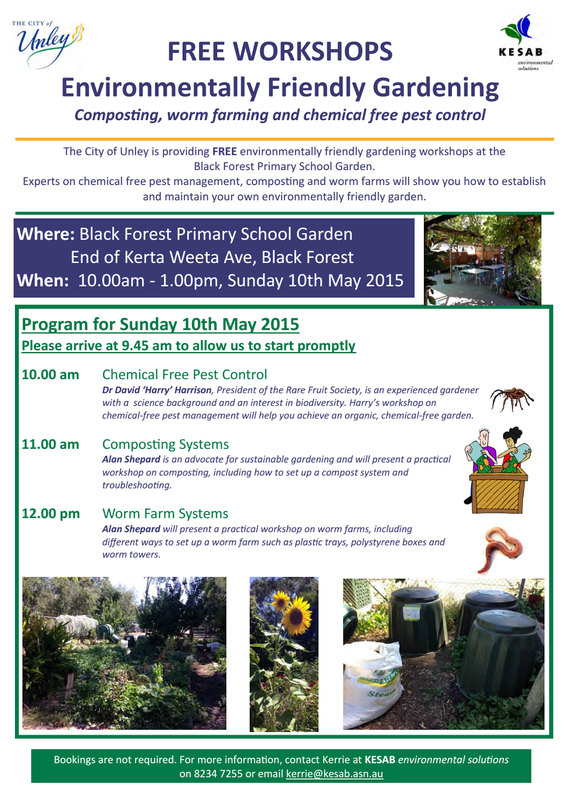 The first BUG meeting will be held at 6 - 7.30pm, 21 April 2015 at the Unley Community Centre, 18 Arthur Street, Unley SA 5061. The urban design framework (UDF) for Goodwood Road identified a range of opportunities to improve the village precinct. The under-grounding of the powerlines between the tramline and Victoria Street provides Council the opportunity to review the UDF and to plan a new future for the precinct. Completing our online survey at yoursay.unley.gov.au by 5pm 15 April. 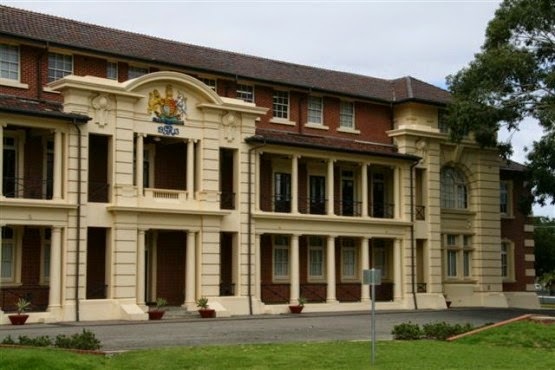 Participating in the Community Forum, 8 April, 6-7.30pm at the Goodwood Community Centre, 32-34 Rosa Street, Goodwood. Attending a ‘drop-in’ session located on the street, 7-11 April, 10am-12.30pm. Contrary to the article in the current Eastern Courier Goodwood Library is not about to close. However, the recent report put to Council did outline some cost savings and service improvements that could occur as the service was reviewed. It is the Council's preferred position that cost savings be investigated and I think we all realise that library services have changed dramatically this century and are likely to continue to do so. It is possible that Goodwood Library could manage in a smaller floor area and that duplication of the toy library service is unnecessary. Even when I used this service myself it seemed to be over serviced. Proposals that staff raise should be investigated and as they look at the issues and level of service that our Community want any changes will be made in consultation with the Community. However, the small service that is operated at Fullarton will close and be replaced with a portal where books can be ordered and collected. Not sure how this will go with the less than tech savvy oldies that use this facility. It was not something I supported. I also have serious concerns about even considering building a purpose built library when the libraries we have seem more than adequate. 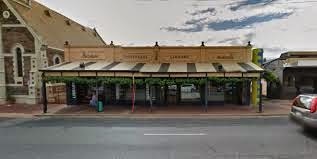 Repurposing the existing heritage listing building on Unley Rd should not be something too difficult for Council when we expect our constituents to reuse existing commercial building and houses that are heritage zoned and/or listed in new and innovative ways.